Ophthalmology is the branch of medicine that deals with the medical and surgical treatments of the eye. 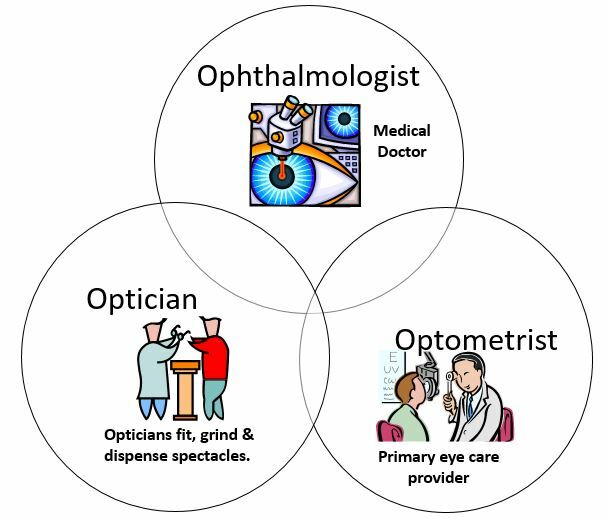 An ophthalmologist is a medical doctor (MD and FRCSC) and they differ from optometrists and opticians in their levels of training and in what they can diagnose and treat. 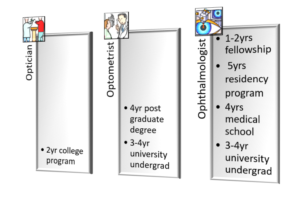 Ophthalmologists are leaders of the eye care team due to their length of training and specialization. An ophthalmologist has completed a 3-4-year university degree and at least eight years of additional medical training. For this reason, they are considered to be both surgical and medical specialists. An ophthalmologist diagnoses and treats all eye diseases, performs eye surgery, prescribes and fits eyeglasses, prescribes contact lenses, and prescribes medicine to correct vision problems. While ophthalmologists are trained to care for all eye problems and conditions, some ophthalmologists specialize in a specific area of medical or surgical eye care. This person is called a sub-specialist. He or she usually completes one or two years of additional, more in-depth training called a fellowship in one of the main sub-specialty areas such as glaucoma, medical retina, surgical retina, cornea, pediatrics, neuro-ophthalmology, uveitis, oculoplastic, and low vision as well as others. This added training and knowledge prepares an ophthalmologist to take care of more complex or specific conditions in certain areas of the eye or in certain groups of patients. Many ophthalmologists are also involved in scientific research on the causes and cures for eye diseases and vision disorders.